Food spoilage and waste account for annual losses of US $310 billion in developing countries, where nearly 65% of lost food occurs at the production, processing and post-harvest stages. In Sub-Saharan Africa alone, up to 150 kgs of food produced is lost per person every year. Depending on the crop, between 15 and 35 percent of food may be lost before it even leaves the field. 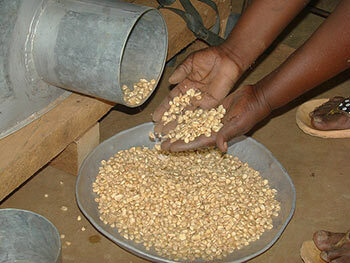 Pests and diseases can devastate a farmer’s output once it has been harvested and is stored for sale or consumption. One MAIZE CRP key partner project, the Effective Grain Storage Project (EGSP), is helping African maize farmers to protect their source of food and income. Affordable metal silos, produced and distributed as part of the project being implemented by CIMMYT and partners, are enabling farmers to store their crops safely, rather than lose them to pests or being forced to sell them off cheaply straight after harvest when prices are at their lowest. Made of galvanized metal, the silos are airtight, so they keep out insects and suffocate any that might have been stored along with the grain. The project also produces hermetic post-harvest bags in four African countries – Kenya, Malawi, Zambia and Zimbabwe – which protect harvested grains from attack by destructive pests, such as the larger grain borer (Prostephanus truncatus) and the maize weevil (Sitophilus zeamais). The metal silo technology, which can also be used for other crops such as beans, sorghum, millet, cowpeas and pigeon peas, also provides good business opportunities for local artisans, earning them over US$3,000 per year if they make five silos per month.